I could not thank these guys enough. I hired two sets of Sumo suits for my boys and their friends yesterday as a going into hospital farewell surprise for them to look forward to and it couldn't of gone more perfectly. The booking was easiest ever! No payment on booking needed which I find very trusting of this company. Drop off and collection was dead on time and couldn't of been more polite and friendly. fantastic company all round and will certainly be using in the future!!! Thank you very very much. Some very happy children!!!! 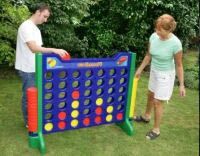 The official Hasbro connect 4, this is great for children and adults giving hours of fun! Ideal for children parties, public events, fairs weddings and even corporate entertainment.